Dave Gray talked about how a connected company focuses on customer efficiency instead of company efficiency at the No Pants Festival 2015. A connected company has multidisciplinary teams where people work together to deliver a product or service. People working at a connected company feel empowered, they are able to solve problems together and to better serve the needs of their customers says Gray. At the start of his talk Gray asked the attendants to close their eyes and imagine that they are five years in the future. Then he asked them to wake up, look around, and think about what they see. To support the attendants to build an image he asked questions like: Where do you live? What do you do? Imagine that you are having breakfast and then go to work, how would you go? Would you walk, take a train, step on your bike, or work at home? Next he asked the attendants to imagine that they are working on an interesting project. He asked them what the team and their boss look like. The attendees made notes of how their day was, and shared their stories with other people at their table. Many mentioned thinks like having freedom in their work, doing a mix of working at home and in offices, meeting with people, working together, and travelling. This is how people would like to be working in the future. Some of the people in the room mentioned that are doing this already now, it’s possible. Gray drew an image of how companies typically look, which he calls the divided company. He used a pyramid to visualize the hierarchy, showed how work is divided up into task, and how processes help to flow work through the company. He drew the customer outside the pyramid. A divide company focuses on internal efficiency, not on the customer, said Gray. Suppose a customer has a problem with a product or service. Since most customers feel that calling is usually a hassle when they are having problems they first look on the internet. Since they can’t find their answer there they decide to call. They get a voice system with many choices, advertisements and when they are finally connected to a person it turns out that that person doesn’t have the answer. So you are put on hold, transferred to another employee where you have to tell you problems again. Who also can’t help you so you ask to be connected to a supervisor. The hassle that they expected is happening, again. Employees are often incentivized for how fast they can help people. Efficiency is how fast calls are done. Even if they cannot provide an answer, for them the call is finished when they turn it over to another employee. For the customer it remains unfinished as his problem is not solved. Since the customer had a bad experience he decides to switch to another company or product as soon as he is allowed, said Gray. We are moving from a relatively stable world to a VUCA (volatile, uncertain, complex, ambiguous) world. Next to the image of the divide company Dave drew an image of what he calls the connected company. In a connected company the customer is at the center of everything. Such a company is about customer efficiency, not company efficiency. If a customer makes a call to a connected company then they get a real person, there is no voice system. Employees in the company pick up the phone if a customer calls. They try to solve the problems of their customers. If they can’t solve them they will involve colleagues to solve the problem. The employee that picked up the phone stays with you until the problem is solved, said Gray. A connected company measures if problems get solved. They measure customer efficiency, how fast do customers get results. They are oriented towards serving the needs of their customers. Employees in connected companies have more autonomy. 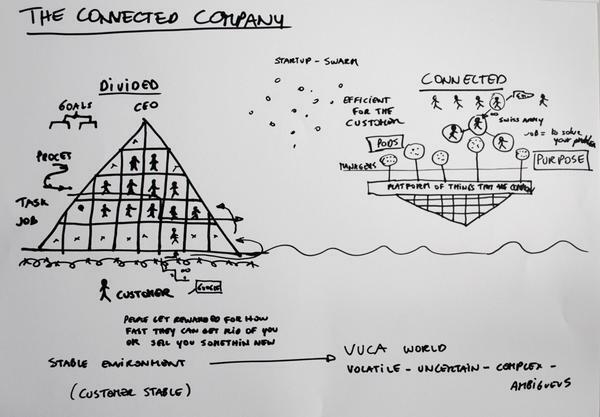 In connected companies there is also a pyramid, but it is upside down. Such a company will still have things that are shared and common, which are the same for everybody. Dave called this a platform. Connected companies have PODS, a kind of cells where people are working together to deliver value to customers. People working in a POD feel empowered, they are able to solve problems together. We need a podular way of organizing our work said Gray. PODS are multidisciplinary which makes it possible for the people working together to deliver a product or service. Are company efficiency and customer efficiency competing? They do not have to be said Gray. There can be things that are efficient for both, for example solving a problem on the first support call. This is for the same reason that a cross-functional team working together can be more efficient than an assembly line. When work is more complex and variable, problem-solving teams can be more efficient than linear work flows.